Note: A number of these listings are pretty old. No telling if the item is still available....I usually wait to hear from the owner to remove the ad. This is offered as a general service, no assessment of value or quality should be assumed from being listed here. Please notify me when the item is no longer current. The dates in brackets are the dates the information was added to the page. 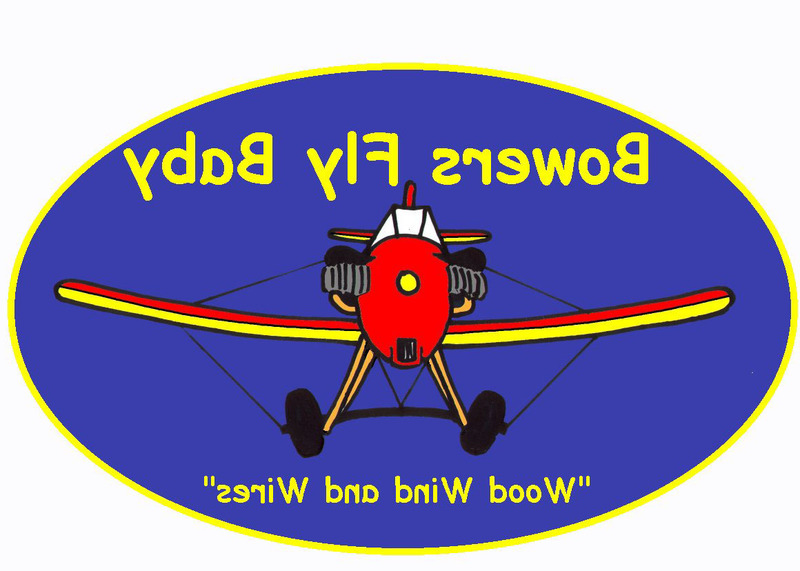 See my Buying Used Fly Babies page for what to look for, when evaluating a flying aircraft. 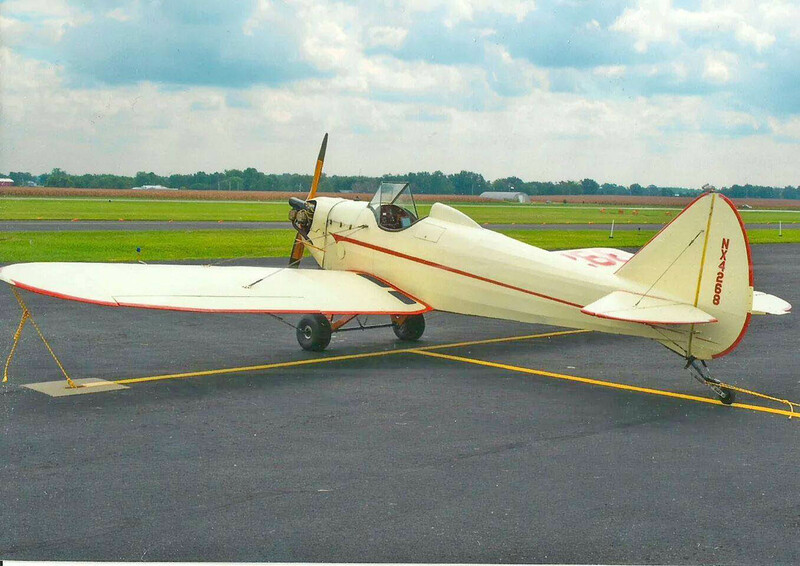 John Tiner has his well-traveled Fly Baby for sale. N4268 has a 75 hp engine and electric start, and he's asking $6,900. Compression 73/74/74/72. New stainless steel exhaust and new carb heat shroud 2016. Time 357 hrs SMOH. Airframe: Built 1974. Fabric recovered in 1996 and hangared since then. Currently in fully enclosed hangar at Sullivan, MO KUUV. Grove hydraulic brakes, Matco tail wheel. Goodyear premium 800-4 4 ply rib tires 2016. No electrical system, starts from rechargeable battery. Safety improvements include 1/4-inch carry-through bolts for the wing cables, reinforced bulkheads that carry the wing bolts, other improvements. TT 357 tach-hrs. Propeller: Sensenich 72x42, wooden with metal leading edge. Lightly sanded, varnished, balanced by Culver Props 2015. Instruments etc: oil temp, oil pressure, air speed, altimeter, tach, compass, ball slip indicator, carb heat, primer, and vernier mixture control. Logs: Complete engine and airframe logs. Condition inspections: N4268 has a current condition inspection. 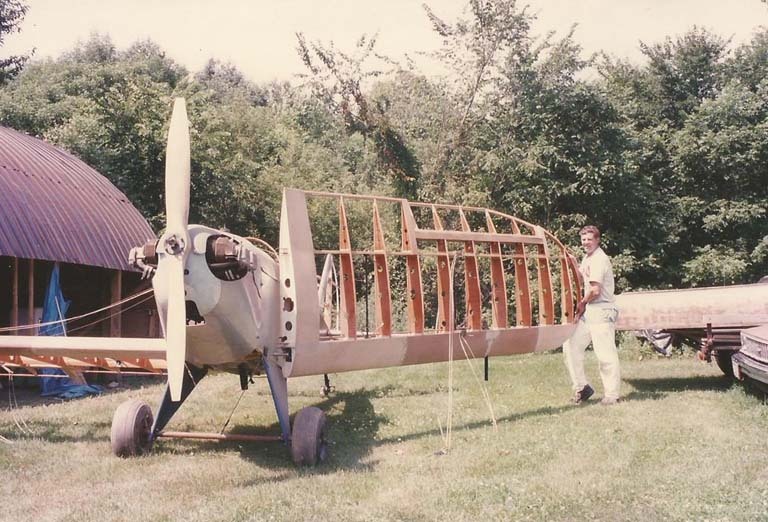 All condition inspections since 2010 have been done by a well-respected St. Louis A/P who has owned, flown, and repaired Fly Babies as well as other wood and fabric and vintage aircraft. Damage history: Two hard landings with damage and repairs documented in the logs. 250 tach-hr of flying since most recent damage repair. Some upgrades and minor repairs are more recent. Reliable aircraft: Engine starts promptly, runs smoothly. N4268 has crossed the United States “vertically” from Pembina, ND to Galvestion, TX; and half way across the United States “horizontally” from First Flight NC to Ponca City, OK.
With Jeff Patnaude's permission, we took his flying baby artwork and turned it into a fantastic jacket patch. We've named the baby "Roscoe" after famed 1930s pilot Roscoe Turner, hence the term "Roscoe Patch". "Roscoe" was designed for Jeff by Pat Moriarity. Be advised: This not your wimpy little 3" shoulder patch. The goal was to duplicate the look of the squadrom patches worn on WWII flying jackets. This patch is a big, bold, five inches in diameter...it's larger than the palm of your hand. Years ago, I showed Pete Bowers the nose art on my airplane, which was cribbed from a "Far Side" cartoon. 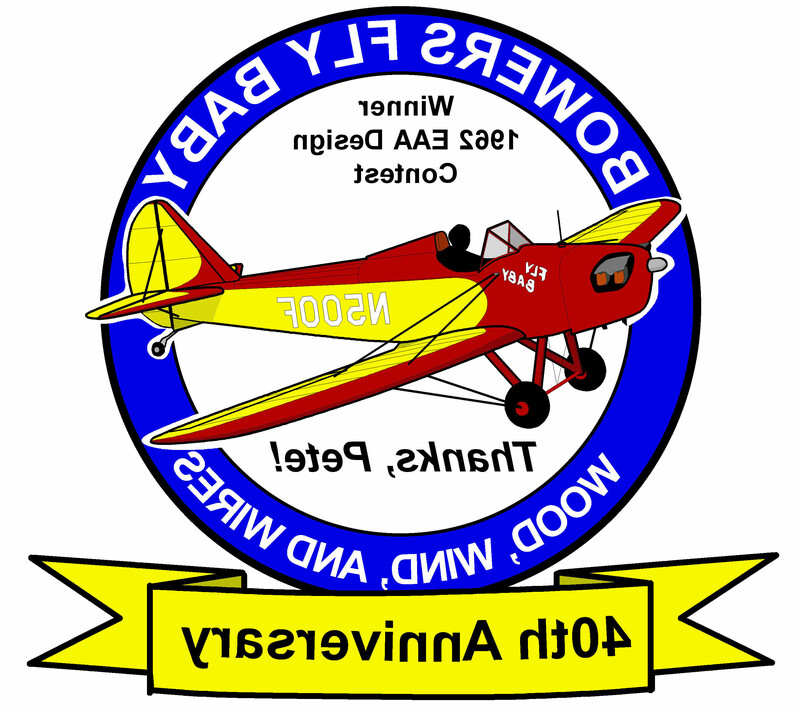 Pete said he liked it because it included the original "Fly Baby" lettering/nose art from N500F. 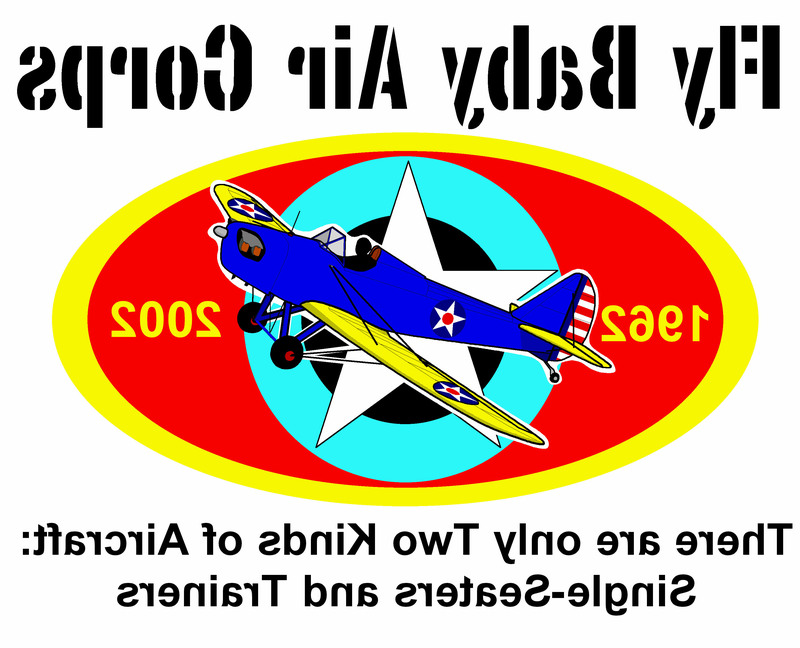 Hence, the new patch shows Roscoe atop the same yellow lettering on the red background, just like Pete had on the original plane. I'm asking $7 for the first patch, and $6 each for additional patches ordered at the same time. Email me for the ordering address. It's been a long-time tradition for aircraft to carry nose art, and Roscoe is as worthy as they come. When Hans Tiejgeler bought his Fly Baby in mid-2014, he wanted some big 'ol Roscoes on his plane. Print shops being what they are, it cost about the same for Hans to print up a couple dozen as for just a couple. I bought his extra, and now you can proudly plaster Roscoe over whatever surfaces you want...nose, tail, rear hatch of the wife's SUV, whatever. The price, including postage, is $6 for the small ones ($10 for a pair), or $12 for the big ones ($20 for a pair). Email me at ron@wanttaja.com if you're interested. The images that follow were the candidates for the Logo contest. 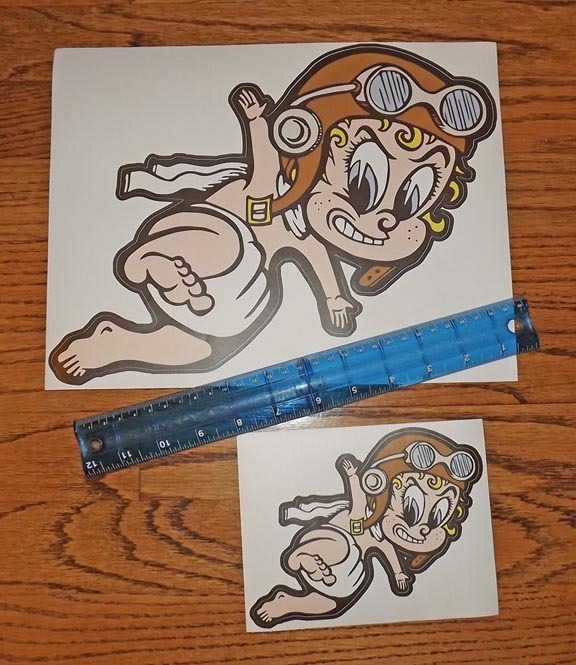 With an ink-jet printer, you can make use these images to make iron-on transfers for your own T-Shirts. Right-click on the title of the images you want, and select "Save Target As" or "Save Image As" (depends on your browser). Or you can click on the image itself, and then right-click it and select "save picture." The images range from 150K to 800K in size. These images are mirrored since that's how you print on the T-shirt transfer material. The material can be found at nearly any office supply store (Office Depot, Stapes, Office Max, etc.). I'd buy a pack of three T-shirts and count on wasting at least one on the first try. 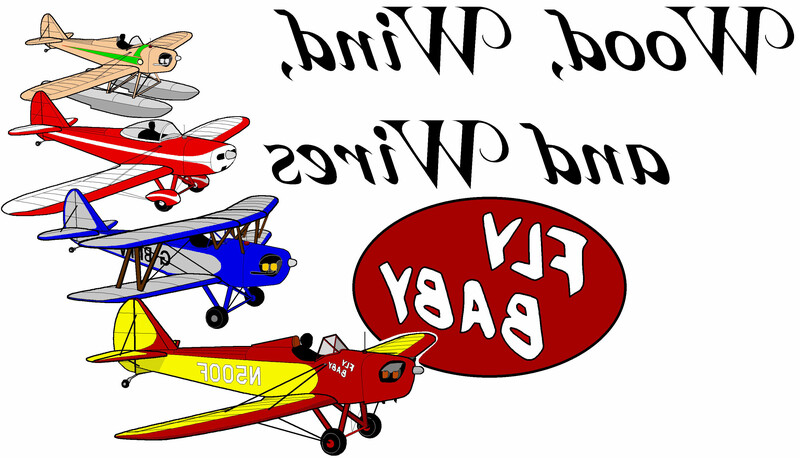 The formation contains a wide variety of Fly Baby variants, from the original prototype, to a biplane, to a plane with closed cowling and bubble canopy, and a Fly Baby floatplane. All the depictions are based on real Fly Babies, although the one shown on floats has never had floats installed. Some say this image isn't as dramatic as a T-Shirt since there's a lot of open white space in the image. Frenchman Jean-Pierre Nugyen's entry into the Fly Baby contest. I'm sorry, but this site tickles me so much I have to include it. Back in the "good old days," aviators of less-than-perfect vision could get prescription flying goggles . Looks like we STILL can, 'cept they're mostly meant for the motorcycle crowd. Back in the late '60s, Hayden Ferguson published a newsletter for Fly Baby builders. Hayden has kindly provided me with a clean copy of all the newsletters, and permission to reprint them. This are of pretty good interest to Fly Baby builders. There are a number of hints and suggestions, and a total of 200 pages (printed double-sided, so there are only 100 sheets). Be advised there is an equal amount of "What Joe Smith is working on now" sort of information...vital and informative when the newsletter is mailed out, but of less use to builders thirty years later. It's fun to read, though. Anyway, I ran some copies for the Fly Baby mailing list members, and have about five left. I'm selling these for $20, US Postage paid. Email me for ordering information. These the bulletins are also available for free download. A few hard copies are still available. If you prefer, I'll send you a CD with all the content for $5 (postpaid). Questions? Email Ron Wanttaja .